Gearing up for India. Thanks guys! Plans are starting to take shape! Miguel and I will be arriving in Mumbai on July 9th at 3:30am and we already have workshops scheduled for July 10, 11, 12, 13. We have a place to stay when we arrive (thanks to Madhuri, a sweet friend I stayed with last time I was there) and we’re waiting to finalize the dates on a few more plastic bag crochet demos. I think it’s amazing that many of the India contacts I managed to make were strictly through responses to posts I wrote on Couchsurfing groups. And I also think it’s amazing (and encouraging) that I’ve received so much support for this project. I created this Special Thanks page to give a shout out to people and organizations who pledged on Kickstarter, mailed me crochet hooks, sent me donations, or are helping to support my trip in some shape or form. This list will likely grow as my trip progresses. 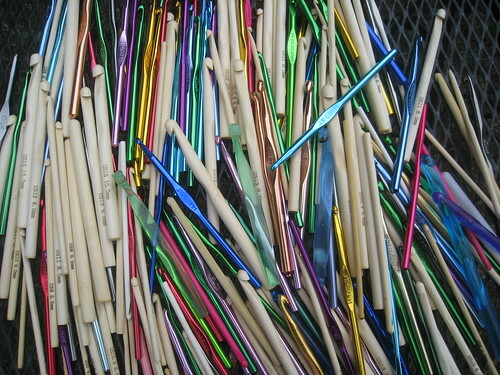 Also…in preparation for this project, I have accumulated more than 200 crochet hooks already and will likely purchase more once I arrive in India. I will be posting updates along the way, so stay tuned! Hi, I’m Rajesh near to Bangalore, India. Many of the larger hooks I got in India are from a company called Pony Needles. They’re based in Chennai. Alternatively, you can contact a woman named Eesha in Mumbai who resells them. I bought mine through her.